Melatonin is a hormone, which is involved in the control of the circadian rhythm, but also acts as an antioxidant and immune modulator. Previous studies reported decreased salivary and serum melatonin levels in periodontitis. This prospective cohort trial assessed the effect of non-surgical periodontal therapy on melatonin levels. Salivary and serum samples of 60 participants (30 patients suffering from a severe generalized form of periodontitis, 30 healthy controls) were collected at baseline and 19 samples of periodontitis patients after treatment. Salivary and serum melatonin levels were determined by a commercially available ELISA kit and serum C-reactive protein (CRP) by a routine laboratory test. At baseline, periodontitis patients showed significantly increased serum CRP values and significantly decreased salivary melatonin levels compared to the control group. 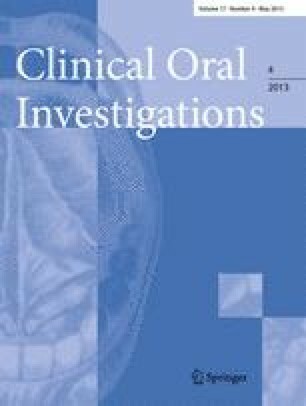 Clinical periodontal parameters significantly correlated with salivary melatonin levels and serum CRP. Periodontal therapy resulted in a recovery of the decreased salivary melatonin levels and a negative correlation was detected for the changes of salivary melatonin and the inflammatory parameter bleeding on probing. Serum melatonin levels showed no significant differences. Salivary melatonin levels recovered after periodontal therapy and correlated with a decrease of local periodontal inflammation. This may imply the local involvement of melatonin in the pathogenesis of periodontitis due to its antioxidant abilities. However, the exact role of melatonin in periodontal disease remains to be investigated in future trials. The present results suggest salivary melatonin as a risk indicator for the severity of periodontal disease. The authors thank Mrs. Hedwig Rutschek and Mrs. Phuong Quynh Nguyen (laboratory technicians of the Bernhard Gottlieb School of Dentistry, Medical University of Vienna, Austria) for their excellent work in preparing and performing the experiments. Greiner Bio One supported this study by financing materials (reagents and saliva collection system) (Medical University of Vienna, §26, project number AP00345OFF).